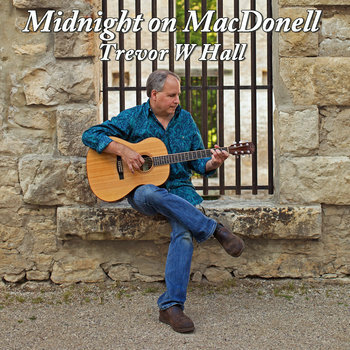 My third release "Midnight on MacDonell" is now available! This is a collection of 21 acoustic instrumental songs that have been arranged into full productions. Hopefully you will find this recording to be nice listening while working around the house, entertaining, driving or just out for a walk. MacDonell is pronounced "Mac - Doe - nell" and it is the name of one of the main streets in downtown Guelph. It has a way of coming alive around midnight. I hope you enjoy this music! I have made the digital download available as a pay what you like. Please feel free to download and enjoy for free. If you would like to help out with some of the costs of production, thanks! Also, sign up to my mailing list if you are interested in email notifications of any upcoming gigs, thanks! I'd like to thank Christine Saunders from www.christinesaundersphotograph.com for many of the fine pictures on this site! A simmering finger style song that builds to a nice close. Please join my mailing list for gig announcements and news, Thanks! The Village Well has a nice warm atmosphere well suited for a freezing cold night. It's a great place to meet with friends, grab a bite and request a song or 5. Request Night at the Village Well! The Village Well is a great place to meet up with some friends, have a bite and enjoy a beverage. It is very friendly and cozy with a nice atmosphere. The limestone wall is gorgeous! Come on down for an enjoyable night and pick out a few tunes of my Request Menu! Enjoy an evening of music, food and beverage with some friends. I'll play whatever you like of my extensive song list. Also I play at a volume that allows you to actually have a conversation! Just 15 minutes down the road from Guelph. Enjoy an evening of music, food and beverage with some friends. I'll play whatever you like of my extensive song list. Also I play at a volume that allows you to actually have a conversation! So "Come on Down", it's literally just 15 minutes from Guelph! A great spot for an afternoon of hanging out with friends and listening to music. I'll play whatever you like off my Song Menu. There are over 250 songs with something for everyone. Hope to see you there! A great spot to have a bite, hang with friends and listen to music. I'll play whatever you like off my Song Menu. There are over 250 songs with something for everyone. Hope to see you there! You pick the songs off my list and I'll play 'em, simple as that! Great food and atmosphere. Come on out! The Village Well is a great place to meet up with some friends, have a bite and get some food. It is very friendly and cozy with a nice atmosphere. The limestone wall is gorgeous! Come on down for an enjoyable night and pick out a few tunes of my Request Menu! I'll be at Ernie's from 7 to 9. Come on down, it's a charming place! Request Night with Trevor Hall at Red Brick Cafe! Midnight on MacDonell CD Release Party! I'm proud to announce the release of my third CD, Midnight on McDonnell! The previous release parties have been a hoot and this one will be the same. A night of all original music from several local artists/bands to be announced later. Save the date with more details will come!